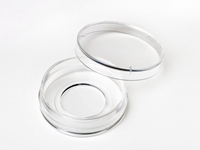 35mm glass bottom dish, well size 20mm, #1.5 glass-like polymer cover slip(0.175±0.010mm). Recommended for applications where better cell attachment is desired. Not suitable for total internal reflection fluorescence (TIRF). D35-20-1.5P , request a free sample or get a quote. A USP class VI adhesive is used to assemble the coverslip and the dish.